The following is a guest post from Aaron Ford, digital advertising manager for online media distributor The Orchard. Aaron regularly helps recording artists advertise on various networks, so we feel like he probably knows what he’s talking about when it comes to advertising music. We hope this is of interest to recording artists and readers who are curious about the decisions artists face when contemplating how, why, and when to advertise their songs. Deciding to spend money to increase awareness of your project is a big decision. You’ve probably already spent a ton of money creating your art and the idea of spending again may be anathema to you. You may have already gathered the funds for a large-scale media purchase and are ready to go. I don’t know this and have no supernatural powers. I’m just writing a blog post for The Daily Rind and trying to help. Managing our clients’ and our internal advertising budgets, I’ve seen the gamut of situations in which advertising could be useful and have executed campaigns. I’ve found that a step-by-step thought-process prevents one from completely blowing it. Completely blowing it can mean wasted money or a project no one knows about. This is my process and the one I recommend to others. 1. Define your goals – What do you want to accomplish? Do you want to grow awareness, or drive those that are already aware to a place to purchase? 3. Research your fans and potential fans – Who should receive this message? You may not know who your fans are as much as you think you do. Even if you’re the label, you can lack perspective. You have no objectivity and that’s normal. Rely on data and numbers to combat your definite bias. Use tools such as Facebook Insights. Pay special attention to the “People” tab. Those are the ones who engage with your page. Some people are lazy and just Like pages they do not plan to engage with. The “People” tab shows you who the engagedfans are; the people who will buy your stuff. You may also find tools like Google Analytics, Beluga (free), Next Big Sound, Musicmetric, and others handy. Create useful names for the different segments: “18 – 24 year old bros in Arizona who love action sports” or “Hipsters that pirate your stuff in Silverlake.” All of this is valuable if you create segments that mean something to you. 4. Identify your targets – Who do you want to receive the message based on your research? Maybe you’ve found that your audience is “75 – 85 year old vagrants with an iPod touch and Starbucks WiFi.” This is not an audience that is worth your hard-earned, borrowed, or stolen ad dollars. If your goal is to create awareness for a video, even though most of your audience are these vagrants, you should target the small part of your audience that is of a demographic using the platform on which your video is published. If your budget is limited, you should focus first on the fans most likely to purchase and only go outside of that fan-base after you’ve given the core fan-base every opportunity to give you money. They can be best targeted through tracking pixels from third parties such as Google, Facebook, or The Trade Desk. 5. Devise your strategies – In what voice do you want to deliver your message? What’s your angle? Are you enticing people with a free track? 6. Decide which tactics you will use – What tactics will you employ to execute the strategy? Video? Search Ad? Retargeting Landing Page visitors with banners? Asking a question in a promoted post? 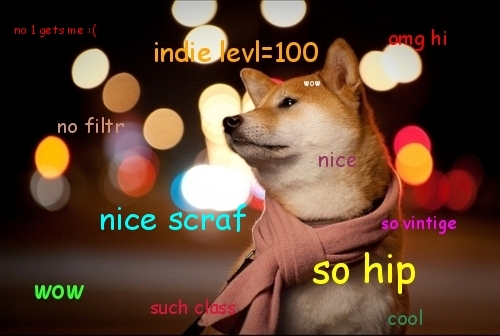 Leveraging memes such as Doge (such link. so lol)? 7. Identify the platforms / technology you will use – Where will you deploy your tactics? Facebook? Google Search? Bing Search? LinkedIn? Banner inventory on the coolest sites? Video inventory? 8. Execute your campaign – Double-check everything. A misspelling or typo can be absolutely devastating to your cause. You don’t want that. We don’t want that. Deploy your campaign at hours of peak traffic for your audience, strategy, tactic, and platform. This may mean that you deploy each part at a different time. 9. Optimize your campaign – Don’t just let it sit there spending your money. Constantly optimize. What’s working? What’s not? Don’t be alarmed by lower click-through-rates (CTR) on banner ads than you see on Search ads. Banners are about impressions and you are billed per impression. Search is about clicks and you are billed per click. 10. Recap your campaign – Even if you are doing your own digital advertising, you should do this step. Create a document that is an overview of the campaign. You will find nuggets of information in this document that you will not find by just looking at numbers on the platforms. 11. Learn from your campaign – After you have created this document ask yourself if it was a success. Go back to your goals. Did your video get more views than they would have without it? Did your Facebook page see a higher rate of engagement? What would you do differently next time? Spending money to promote your work is a big deal and it’s worth your time to go through this process to make sure you don’t completely blow it. I’d love to answer any questions (no centaur questions) or address any feedback so do not hesitate to comment.